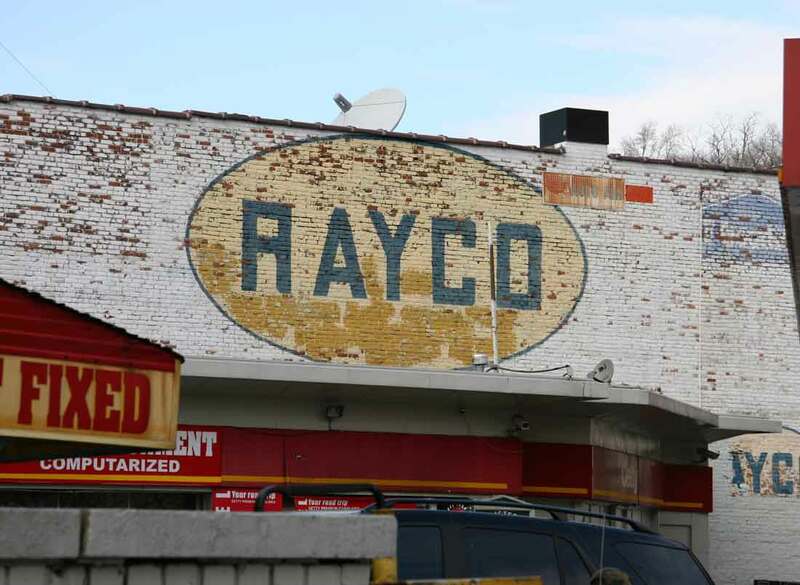 Founded in the late 1940s as Rayco Auto Seat Covers and the Rayco Manufacturing Co. in Paterson, New Jersey, Rayco grew into a nationwide franchise of dealers distributing shock absorbers, mufflers, seat covers and other automotive accessory products. In 1968 Rayco had 150 stores with sales of about $14-million. In 1950 this ad for Rayco Auto Seat Covers appeared in the Washington Post, 23 April 1950. In 1961 B. F. Goodrich bought Rayco, as described in the New York Times, 17 Jan. 1961, pg. 49, "The B. F. Goodrich Company announced today purchase of the Rayco Manufacturing Company, the nation's largest distributor of shock absorbers, mufflers and seat covers. The announcement, made by J. W. Keener, president of Goodrich, and Joseph Weiss, founder, president and sole stockholder of Rayco, said Rayco would be operated as a wholly-owned subsidiary of Goodrich. Mr. Keener said Goodrich would market its tires through the 125 Rayco retail outlets in seventeen major markets. ... Mr. Weiss and the present management will continue to direct Rayco activities. Rayco has retail outlets in the metropolitan centers of New York, Los Angeles, Chicago, Houston, Philadelphia, Detroit, Washington, D.C., Cleveland, St. Louis, Pittsburgh, Baltimore, Miami, Kansas City, Dayton, Milwaukee and Nashville. Rayco manufacturing facilities are at Pawtucket, R.I., and Mayaguez, Puerto Rico." In 1969 B. F. Goodrich in turn sold its Rayco franchises to Cle-Ware Industries, "Cle-Ware Industries, Inc., said it had reached an agreement with the B. F. Goodrich Company to purchase all the assets of Goodrich's Rayco division for about $7.2-million in cash and notes. Rayco owns and franchises 150 auto accessory stores. It had sales of about $14-million last year. Cle-Ware distributes automotive products and other consumer products through discount stores" (New York Times, 8 Nov. 1969, pg. 47). Founder and president of Rayco was Joseph Weiss (1910?-1963). As described in Mechanix Illustrated, Nov. 1954, "It all began shortly after the war when Joseph Weiss, who had a small fabric business, realized that there were only two antiquated ways of buying seat covers - either the motorist bought ready-made ones that fitted like pop's hand-me-down pants, or he had them made to measure at astronomical prices. ... Weiss went to work and soon set up two brothers in shops to retail the new product. Then one day, Weiss conceived the idea of creating a chain of franchise seat cover stores and Rayco was on its way." Weiss died in February, 1963, during the New York 114-day newspaper strike and consequently received only this brief notice in a summary of the news published by the New York Times, 11 April 1963, pg. 36, "Joseph Weiss, 52, founder of the Rayco Manufacturing Company, a seat-cover business that was sold to B. F. Goodrich in 1961, [died] Feb. 5 at Teaneck, N.J."
The Rayco store at 250 Dyckman St. was listed in the Manhattan telephone directory from 1964 to 1993. For the last ten years of this period the business name was Rayco King Bear Auto Service Center. This sign has stood up well over the years. This image from 1989 looks much the same as it did in 2006. And not that different from this one from December 2014.